We believe that the most important lesson a child can learn is that JESUS LOVES ME! Our school is a mission of Faith Lutheran Church. We have been serving the families of Deer Park and the surrounding communities since opening the school doors in 1987. God's love is taught daily! for students ages 3 to 5. Registration packets are available for download on-line. Click the button above to download a packet, then return to the school or mail to P.O. Box 1428, Deer Park, WA 99006 Registration for the 2019-2020 school year is now open! Sign up soon as class space is limited. Play with us this summer! We are hosting summer play dates for all past, present and FUTURE students! Come meet the teacher, play on the playground & maybe get wet on the big water slide too! 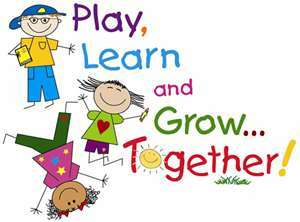 Play dates are held every other Tuesday morning from 10:00 a.m.- 11:00 a.m. or so, starting on June 26th. They give kids a change to see just how fun going to school can be! It's fun to meet new friends as well (moms and dads, this means you too!) Parents must stay with their child(ren) during the play dates please, no drop offs. Hope to see you on 6/26, 7/10, 7/24, 8/7, & 8/21. Our back to school Open House will be on Thursday, 8/30 from 5:00-7:00 p.m. The most important goal of our early childhood curriculum is to help children become enthusiastic learners. This means encouraging children to be active and creative explorers who are not afraid to try out their ideas and to think their own thoughts. We strive to help children become independent, self-confident, inquisitive learners. Through positive encouragement and creative exploration, preschool children learn to to separate from parents and see themselves as a capable individual. Children work on skills alone and in group activities which help them develop social skills and create a joy for learning. Students will be exposed to letters, alphabet, numbers, colors, their name in print, music, art, literature, science, and Bible stories. 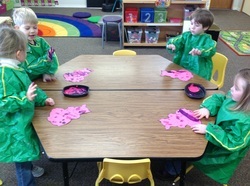 They will learn and practice skills in the areas of fine and gross motor. This group will venture out of the classroom a few times a year on field trips that directly relate to the learning in the classroom. They also get to be stars of the show during our two annual programs, at Christmas and in the spring. We do play outside if the thermometer reads above 40 degrees and it's not raining. Please make sure that your child is dressed appropriately each day. Mon., Wed., Thurs. 8:30-11:30 a.m.
classroom readiness while helping students enjoy learning and experience success. Students also work on writing skills, music, art, literature, computers, science, cooking and Bible stories. 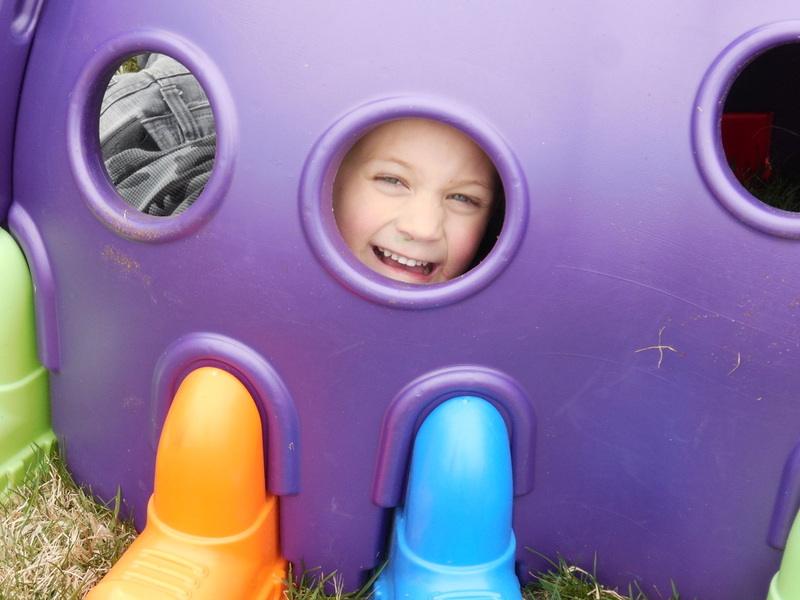 There are many opportunities to practice skills in the areas of both fine and gross motor. Pre-K is a great place for children to see themselves as a responsible individual. Outside the classroom learning, is nearly a monthly occurrence for this group with field trips that directly relate to our monthly theme; including the pumpkin patch, the fire station, the grocery store, the garden center, Pizza Factory and even the bowling alley! As long as the thermometer reads 40 degrees or above and it's not raining, we will be going outside to play. Please make sure your child is dressed appropriately for the weather. Students need to be age 4 by Dec. 31st to be enrolled in this class. Please note: Preschool is NOT a prerequisite for Kindergarten. WA State law requires that children must be age 5 by Aug. 31st to enroll in Kindergarten. For kids who miss the Kindergarten cut off or just need one more year to be little! For kids who have summer birthdays that are not quite ready for kindergarten and kids with fall birthdays that miss the age cut-off deadline. A more advanced curriculum of teacher-directed and child-chosen planned activities help prepare children for a lifetime of learning. 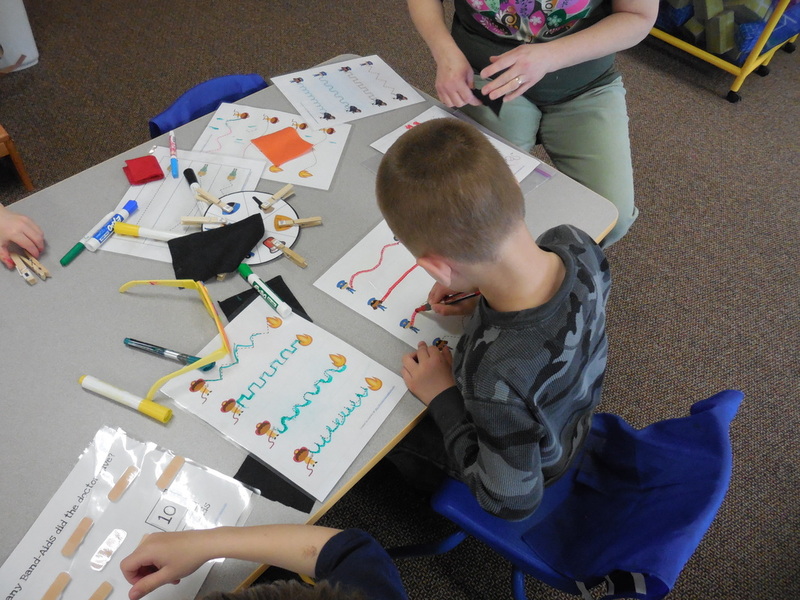 We emphasize pre-kindergarten and kindergarten skills such as letter & sound recognition, number sense & simple mathematics and continued classroom readiness while helping students enjoy learning and experience success. Students also work on writing skills, music, art, literature, computers, science, cooking and Bible stories. There are many opportunities to practice skills in the areas of both fine and gross motor. Pre-K+ is a great place for children who either need a little more time to be ready for kindergarten or just didn't meet the state age requirement. They too will learn to see themselves as a responsible individual. Outside the classroom learning is also nearly a monthly occurrence for this group with field trips that directly relate to our monthly theme; this group will be joined with the Pre-K class trips and includes the pumpkin patch, the fire station, the grocery store, the garden center, Pizza Factory and even the bowling alley! Students need to be age 5 by Dec. 31st to be enrolled in this class. (exceptions can be made at the teacher's discretion). Mon., Wed., Thurs. 8:30-11:30 a.m. + Tues. 12:00-3:00 p.m. Tuition payments are due in 10 equal parts. The monthly payment amount is 1/10 of the total years’ tuition and does not reflect on how many days of school there are in a particular month. The entire cost of the year is averaged out into 10 equal payments, payable Aug.—May. Full annual tuition paid by September 15th will waive the registration fee. Members of Faith Lutheran Church will receive a 10% reduction in tuition for their children enrolled in our program. This discount applies to children or grandchildren of current members. Families enrolling more than one child at a time will receive a sibling discount of 10% off the youngest child's tuition. All tuition is due on the 15th day of the month prior to the current month of school. i.e., October tuition will be due by September 15th. The school provides each student with all necessary supplies; pencil box, crayons, scissors, glue etc. and a school t-shirt. Children may bring a backpack to school if they desire. 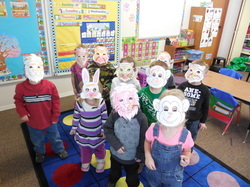 Precious Little Lambs Preschool is a non-profit community service provided by Faith Lutheran Church. All tuition is used for the operation of the school. Mrs. Kim Ferrell became a part of our program in 2001 as a parent of a student, and then joined the staff in 2002 as Director. In 2011 she took over as the classroom teacher as well. She is a WA state certified teacher who truly enjoys working with preschool aged children. Miss Kim lives in Deer Park with her husband, her 3 children (all former preschool students) and their ever growing number of pets! Mrs. Cindy Meyers joined our program in the fall of 2011. She came to us with experience as a para-professional from Riverside School District and with an abundance of patience and love. She is a valuable asset to our school and the children with whom she works. Miss Cindy lives in Deer Park with her husband and together they have a grown daughter who is a recent graduate of WSU's school of Veterinary Science. Mrs. Julie Duckworth started in our program as the grandmother of one of our students. In the fall of 2013, she joined in as our preschool class aide. She brings with her over 20 years as a preschool teacher in the Seattle area. There is pretty much nothing a preschooler can do that Miss Julie hasn't seen! We feel blessed to have her as a part of our team. We also love boasting about her grandson and his achievements almost as much as she does! Miss Julie lives in Deer Park, near to her son, her daughter and her grandson. school is able to offer tuition prices that only include the cost of supplies and staff salary. state of Washington. All classroom volunteers must submit to a WA state background check. Father, Faith Lutheran Church opened this preschool in the fall of 1987 as a mission project to serve the children of our community. private preschool in Deer Park, and our commitment to quality education for small children has not, and will not, ever change.